We start with a big development in the legal investigation into contacts between President Trump's associates and officials in Russia. 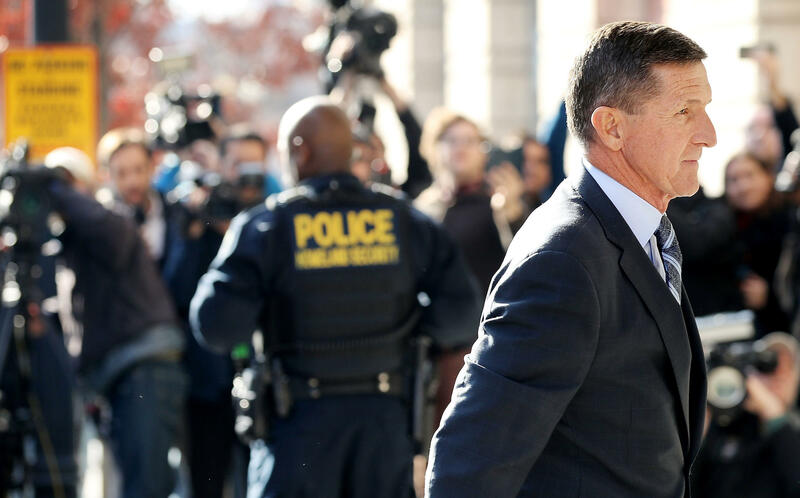 The president's former national security adviser, Michael Flynn, has pleaded guilty to lying to the FBI about his contacts with the Russian ambassador. He has also agreed to cooperate with special counsel Robert Mueller. NPR justice correspondent Carrie Johnson is here to talk us all through this. Hi, Carrie. CARRIE JOHNSON, BYLINE: Hi, Kelly. MCEVERS: So, OK, first just explain. What exactly did Michael Flynn admit to in federal court there in Washington today? JOHNSON: Michael Flynn has pleaded guilty to a single false statements charge stemming from a January 24, 2017, interview he did with the FBI after he was already in the White House as President Trump's national security adviser. Now, these court documents say that Flynn lied to the FBI in that interview about two things - one, a series of December 22 conversations he had with the then-Russian ambassador, Sergey Kislyak, about possibly delaying a U.N. Security Council resolution on Israeli settlements and, two, a December 29 series of conversations he had with Sergey Kislyak and others about U.S. sanctions and Russia. MCEVERS: OK, so he's pled guilty to lying to the FBI basically. And this is basically a pretty narrow charge, I mean, given - especially that the special counsel was looking at a pretty wide range of Flynn's activities in business and in government. What does it mean that this charge is so narrow? JOHNSON: Yeah. In fact, Kelly, this charge carries a five-year statutory maximum penalty, but prosecutors today say Mike Flynn, under their calculations, could serve between zero and six months in prison maximum. It means in essence that Mike Flynn has something to trade. His son, who was his business associate, was not charged today, not mentioned in court papers at all. And we know based on other information in the court documents that Mike Flynn was under investigation for failing to register under the Foreign Agents Registration Act. He may have in fact lied on that form. He also was under investigation with respect to some of his business dealings in Turkey and Russia. None of those charges appeared today. That's because we think that Mike Flynn has something to trade on other people involved in the Trump campaign, and he's delivering it to the special counsel now. MCEVERS: Do we know what people those - that could be? JOHNSON: There are some hints or clues in the court documents today. Nobody is presented by name. But with respect to the December 22 conversations, we do know that somebody called a very senior member of the Trump transition was interacting with Mike Flynn. We do know that Jared Kushner, a presidential adviser and son-in-law, was very involved in that U.N. effort with respect to Israeli settlements. But somebody close to the transition say - says to me that it was a collaborative effort. Other people were involved like Steve Bannon, Reince Priebus, Mike Flynn and others and that nobody directed anyone else to do anything. There's also a hint in the court documents, Kelly, about a senior member of the transition team. And we do know that with respect to Flynn's contacts on December 29, according to prosecutors, he was talking to people at Mar-a-Lago. Jared Kushner was not in Florida at the time. Jared Kushner was in Hawaii on vacation. Bunch of other Trump associates like Steve Bannon, Reince Priebus, Stephen Miller and Kellyanne Conway were at Mar-a-Lago. We don't know if he talked to any of those people. MCEVERS: OK. So Michael Flynn is the fourth person now tied to the Trump campaign to be charged with a crime this year. What is the White House saying about this? JOHNSON: Yeah. The White House lawyer Ty Cobb has put out a statement saying Mike Flynn was let go or resigned under pressure from the White House for exactly this kind of conduct. And Ty Cobb says nothing about the guilty plea or the charge today implicates anyone other than Mr. Flynn. Ty Cobb also said the special counsel is moving with all deliberate speed to conclude his investigation. It's not sure - or not clear yet how high up in the White House that investigation may go. MCEVERS: And Ty Cobb also emphasized how little time Mike Flynn spent in the Trump administration and mentioned that he was also in the Obama administration, no? JOHNSON: That's true, although Mike Flynn was fired from - by the Obama administration in his job as leading the Defense Intelligence Agency, it should be pointed out. MCEVERS: Right. NPR's Carrie Johnson, thank you very much.